When you want to be really noticed, size does matter. For high impact, visual communication, promotional posters are the solution. Grab the opportunity and get your message noticed. Promote your brand and products by using this powerful eye-catching medium. At Digitex, we specialise in full colour, high impact printed posters. We support small and large print runs, tailoring our service to meet your requirements. Combine this with our in-house design service and we have the solution that is right for you. Use Full colour promotional posters for retail promotions, trade shows, expos and corporate presentations. Promotional Posters can effectively communicate your ideas, products and services. Simply supply a ready to print file or take advantage of our full design service. We also offer a file preparation and checking service to ensure your file will print correctly. Choose from a wide range of stocks including heavy matt poster paper, standard satin poster paper, Backlit media and long life synthetic premium posters. We offer a range of options for temporary, short term or long term use in a full range of sizes including A3,A2,A1,A0 and larger. Select from a range of finishing options including gloss lamination, matt lamination and block mounting to boards. In addition, we offer options for hanging and display systems including gallery mounted frames, aluminium poles, poster holders, poster stands and reusable easy to change wall mounted poster clip frames. If colour is critical to you talk to us about colour matching. We focus on the small details. If you need assistance with Graphic Design we realize every client has different marketing needs. We will talk to you and we are flexible in our approach and design methodology. Whatever the size of the project and budgets we can accommodate your needs. Budget posters are ideal for short term indoor applications where you need to get your message across in a cost effective way. Premium Satin Paper with outstanding print quality and satin finish. Prefect for your presentation or promotion. A premium Interior satin synthetic poster, Tear resistant and great for large hanging prints. 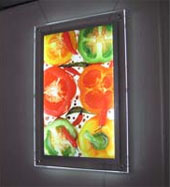 A synthetic media specially designed for Light boxes. 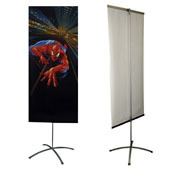 A Special curl-resistant smooth double sided PVC banner designed for indoor use. As required we can source special media just for you job. Call us to talk about your requirements. Mounting prints to card, plastic, metal. Below is just a selection of the display options available. Talk to us about your display needs. Self adhesive strips on top and bottom bars attach to the graphic. Changing graphics in a frame has never been easier! Just snap open the spring loaded frame sides and replace your graphic. Comes with a PVC cover sheet.